Plans hit top gear as the University of Ibadan Medical Students’ Association prepares to play host to over a thousand estimated participants at the 2018 General Assembly of the Federation of African Medical Students’ Association (FAMSA GA ’18). At the International Conference Centre, University of Ibadan, November this year, delegates from across this great Continent and beyond will gather under the theme “Repositioning Healthcare in Africa for Sustainable Development”. The Federation, established in 1968 in the University of Ibadan will also be marking her 50th Anniversary of its existence alongside the 32nd General Assembly in what seems to be a homecoming. The event which is deemed to pass as the largest of such gatherings promises to be groundbreaking for the medical profession, the University and the Continent at large. 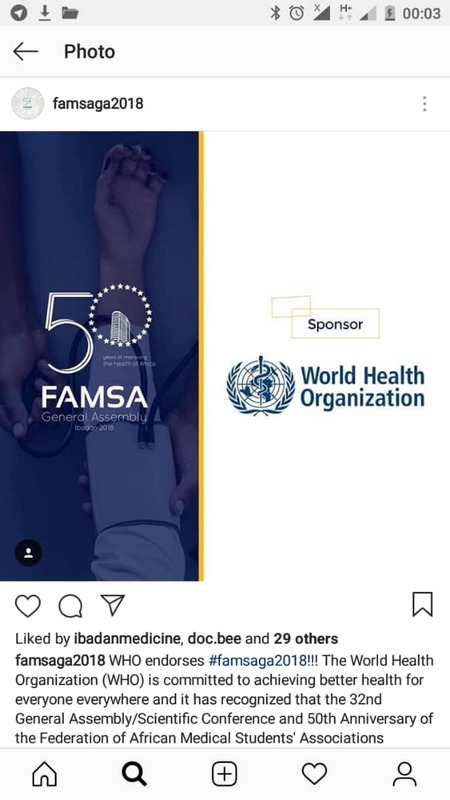 According to the conference website (www.famsaga2018.com), Medical Students, NGOs, Healthcare Professionals, Policymakers and other healthcare enthusiast are expected. According to the Organizing Chairman, Mr. Omiye Tofunmi, participation is not restricted to medical students alone. He hinted on that students from other departments can also register. Currently, abstracts are being received in response to a Call for Submission of Abstracts released last month. The Conference has so far gotten attention on the international scene with one of the most recent being an endorsement from the World Health Organization as announced on the Conference’s social media handles last month. Other announced partners include Kenya Airways, Access Bank, Ibadan City Info and Ynaija. It is expected that other partnerships and endorsements will be announced in the coming weeks. With scintillating high profile speakers announced already and many more to be made public in the coming weeks, the conference promises to etch the name of the Institution on the sands of time as plausible solutions to continental emerging health issues and problems in medical education will be pitched. Of the pool from across Africa are speakers and panelists such as Runcie Chidebe, Vuyiseka Dubula-Majola, Professor Kayode Odusote, Dr. Orekunrin Ola, Adam Thompson and Charles Akhimien amongst others. Previous articleUI POOR TOILET SYSTEM, WHO TO BLAME: STUDENTS OR MANAGEMENT? WHAT MANNER OF BUDGET IS THIS: N21MILLION FOR STUDENTS UNION WEEK?